Our first iPhone and iPad game. You put a falling cat in the basket by tapping it as it falls. Tap as many cats as you can. Each cat you put into the basket adds another point to your score. But be careful, each dog you tap by mistake takes a point from your score. A special big cat, the lion, counts five points, but he's not friendly. He roars and gets in the way of the others before going into the basket. You continue to see falling cats as long as you can successfully tap 9 out of 10 cats that you see. Your success rate is shown on the score board at the bottom. Keep your rate at 90% or better and you will be awarded 10 more cats to see each time the number of cats left falls to 10. 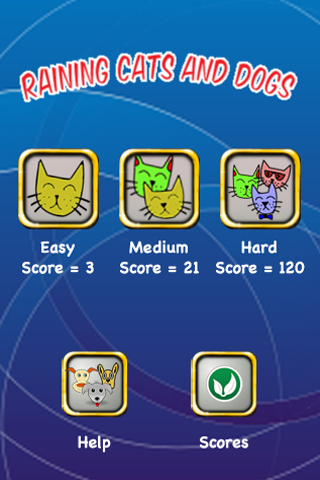 The cats and dogs fall in a different pattern each time you play. And as you play, the cats and dogs will fall faster. The game can be paused and then resumed without a loss of score. When paused, untapped falling cats are removed and the number of cats left to see is adjusted up by that number. You can pause the game by tapping the basket. Pause the game to see your current score and your best high score so far. After you pause, you can keep going and play the game at the point you left, or just start over. The game ends when you run out of cats left to see falling. You may chose to activate a connection to OpenFeint, a mobile social gaming network. 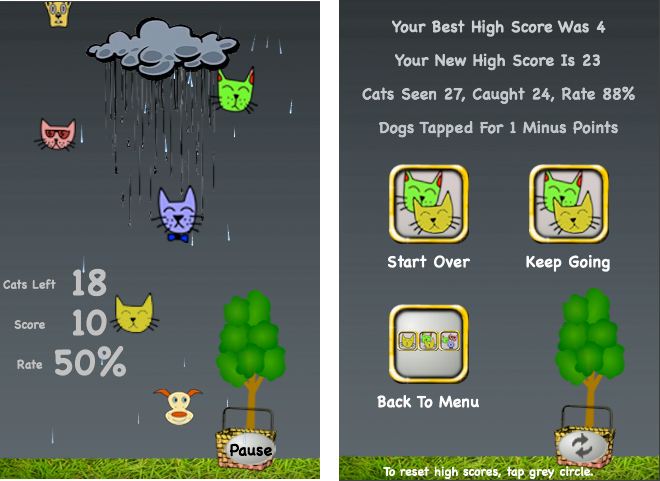 If you do, you'll get a user name and your high scores will be added to the Raining Cats leaderboards maintained by Openfeint. There you'll find a separate leaderboard for your scores for each game level: Easy, Medium, & Hard. Play and compare scores with your friends from Facebook, Twitter, and your address book. Try to beat your friends' high scores.